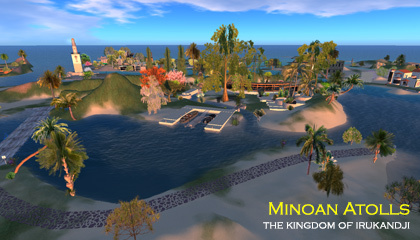 Located in Tamita State in central Irukandji , Minoan Atolls was the fifth sim that I built in Second Life, coming online in early 2007. Like all the early Irukandji sims, it was designed and terraformed by hand. Hugging the east coast of the capital, Tamita Island, Minoan Atolls was intended as a recreational bay to escape the hustle and bustle. It consisted of beaches on all sides with a small flat island at its centre. Popular for snorkeling and swimming, I thought that a small landing strip for light aircraft might make a nice addition. The idea worked well, with several residents buying planes and helicopters to tour around the islands. Around the same time, cars and 4x4s were really starting to take off in SL. 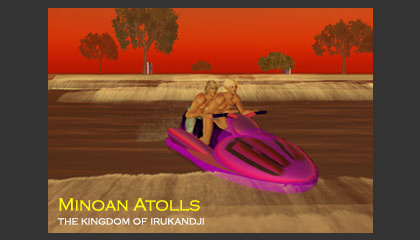 Pre-empting its effect in Irukandji, I began building a rustic 'bush highway', with Minoan Atolls at its centre, providing a handy intersection for residents of the surrounding islands. The network of roads spread quickly into Tamita Island in the west, Grand Irukandji in the north, and Mount Aboyo Island in the south. Unknown to me then, these early roads would become the forerunners to a 31 kilometre-long road network connecting all 55 islands, called the Trans Irukandji Causeway. When the combined ground and air traffic began to prove too much to manage, the airstrip was moved to Hephaistion, which could accommodate much larger aircraft. The central island of Minoan Atolls was then re-terraformed to create a larger atoll, which housed the Irukandji Public Works depot for southern Irukandji. Once all the surrounding road construction was finished, the island was offered up for residential use. A couple of lovely German guys built a magnificent homestead on the island and remained there forever. The adjoining shore with Tamita Island never changed throughout the life of Irukandji and remained a popular playground beach for locals. Throughout its life, Minoan Atolls remained a vital section of the Trans Irukandji Causeway. Yet despite all of its grand functionality, the sim retained its 'banana republic' charm, and everything blended in surprisingly well. 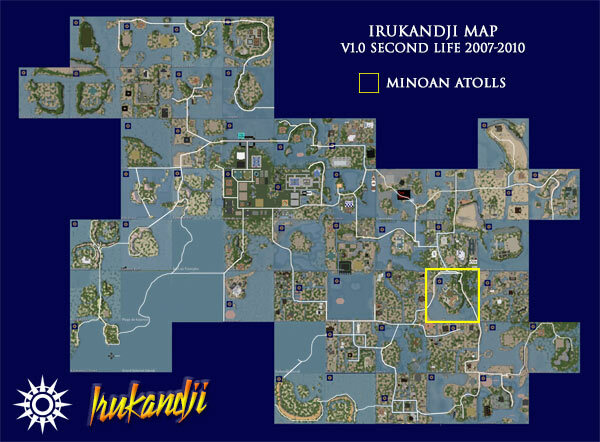 Geographically and functionally, Minoan Atolls was an extremely integral part of Irukandji in Second Life, and I look back on the sim with great affection. 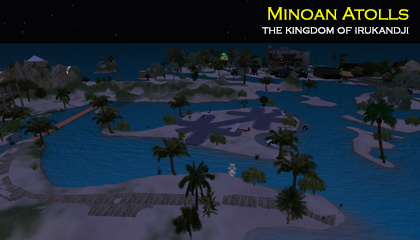 Years later, when I built Irukandji v2 on the InWorldz grid, I successfully reproduced the look and feel of Minoan Atolls as the sim, Lagune d'Or. Regions that adjoin Minoan Atolls are Tamita Island, Baie de l'Amore, Grand Irukandji, Upper Aboyo Passage, Cabria Island, Tora Tora Passage (later Toraboyo Beach), Mount Aboyo Island, and Tiamo Reef. 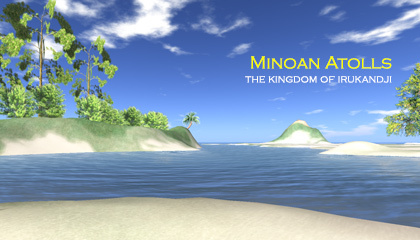 Below you will find more photographs of Minoan Atolls that I took during my travels around the islands.